Rotary Club of Suva Peninsula Sunset president Prashant Anurag with the youngest Rotarian member in the world Tia Punja. Tia Punja was given tickets by her father Rohit Punja to attend a Rotary Club dinner early this year. It turned out to be a fruitful event for her. She was impressed by the club members she met, their work and their enthusiam for service to the community. 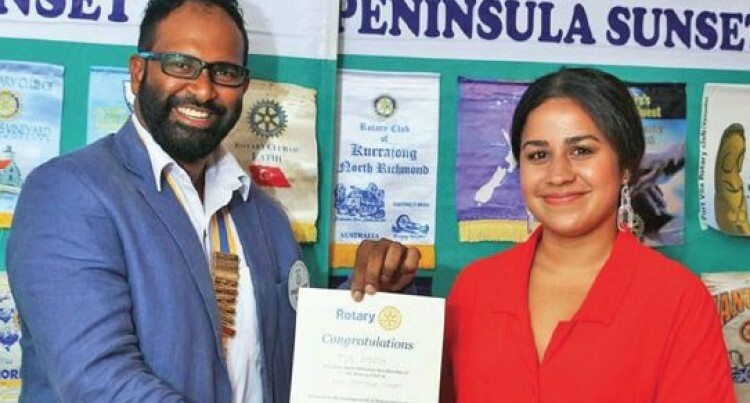 On Tuesday night, the 24-year-old was inducted the youngest Rotar­ian member in the world after she joined the Rotary Club of Suva Peninsula Sunset. Mr Punja is the executive direc­tor of FMF Foods Limited while Tia’s mother is Patricia Punja, the general manager for Camira Hold­ings Ltd.
Rotary Club of Suva Peninsula Sunset president Prashant Anu­rag said: “A big congratulation to Tia Punja for becoming the young­est Rotarian member in the world. Ms Punja is an executive assis­tant and purchasing assistant at FMF Foods Limited in Suva. She is the granddaughter of busi­nessman and chairman of Hari Punja Group of Companies, Hari Punja. “I started in September so I have been working for FMF Foods for a little over three months’ now,” she said. She attended Yat Sen Primary School and at the age of 18 she moved to Wellington, New Zea­land. She attended Victoria University where she completed her Bachelor of Commerce majoring in Com­mercial Law and International Business in 2016. “Which was interesting, I enjoyed living in Wellington, beautiful city and great to study and work in. She worked at AON Insurance for about a year. “Then I got a call from my father, to see if I wanted to move back home. I thought about it for three months after which I decided to move back to Fiji. She got involved with Rotary Club after her father handed her four tickets to attend a Rotary din­ner early this year. “I got handed these tickets from my dad for the presidency hando­ver dinner and he said you’ll enjoy it. “So I told my partner and two other friends for us to attend and so we ended up in the same table as the new Rotary Club president. “Hearing them talk about the new initiatives and what they plan to do and what they have achieved really inspired me. “What was planned to be only dinner and drinks turned out to be something completely different. “From then on I started talking to people at my table and I got their contact information and I told them that once I had moved to Fiji, I would contact them. “As soon as I got back, I emailed them straight away I wanted to at­tend the meeting straight away. “I went to five meetings and sent them my documents, and cur­riculum vitae (CV) and last night (Tuesday night) I got inducted. “I am proud to be part of the club and we always have a great turn­out and people who are part of it are full of energy and ready to do things and are special to me. “My source of inspiration is my family who have always worked hard. “My parents have always been loving and that has always been my inspiration. Her partner Amrit owns Plat­form Sports Management, a NZ based company. He now lives with Tia in Fiji and works from here.